The Briard is an ancient French Herding Breed used as an invisible fence for Shepherd’s needing to contain their flocks. The Briard has proven to be accomplished as a herder and guardian of both flock and Shepherd. They have made their presence known in the show ring and their athleticism is evident in the Briard used for performance events. Briards also excel as therapy and service dogs. Smart, loyal and courageous the Briard makes a wonderful family companion. When well socialized, trained and raised as members of your family Briards will bring years of love and devotion to your life. 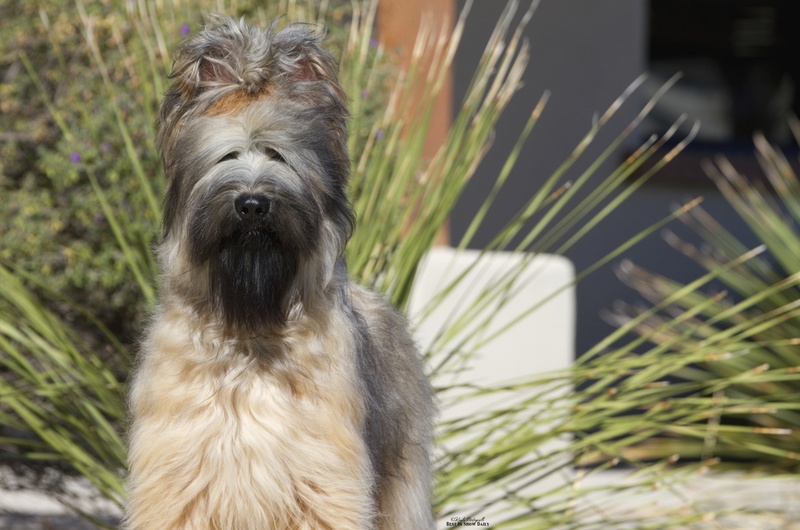 The Briard, sometimes called the Chein Berger de Brie, is an Ancient French herding dog. Such interesting quotes as the following the Briard of Old “The shepherd dog should be big as his Master, strong and robust, for his duties are running and he is expected to watch for the wolves, pursue them and take away their prey. In 1970, Thomas Jefferson’s personal papers were found. They made mention of the Briard and how he highly prized them for their abilities with sheep. The Marquis De Lafayette introduced Thomas Jefferson to the breed. The Briard appears in art and literature throughout history. J.F. Millet, a famous painter of the 19th Century, featured Briards in several of his works. During World War I, Briards were used on the front lines as messengers, search and rescue dogs, sentries and draft animals. In 1922 the first American bred litter was registered with the AKC. In 1928, The Briard Club Of America was recognize by the American Kennel Club and in 1931 the first Briard Championship was awarded. In 1945 the first Obedience Degree was awarded an American Briard. Briards were selected to be working, herding and guarding dogs because of their intelligence and trainability. Consequently there must be a commitment to careful nurturing from puppy hood on the part of the Master. The Briard is not “self-socialized”. Socialization must be accomplished by frequent exposure to sights, sounds and most importantly people during the initial year of life. Many Briards go through a period of shyness. This usually occurs between six and eighteen months of age. Many people believe that this may be due to the veil over the eyes impairing their vision. It is untrue that a coated dog can see through his hair and that removing the hair can hurt his eyes. Briards are require regular grooming, both bathing and brushing to insure healthy skin and a lustrous coat. The standard of the breed requires double dew claws on each rear foot. The dog should be strong and robust with a level top line. You will enjoy your Briard – herding your children, interacting with your other animals and his first Bark! They are silly, funny, loyal and extremely affectionate and always alert.